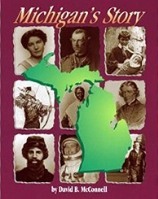 An administrator says, "These are the best Michigan history textbooks we have ever had!" The study of Michigan does not need to stop at 3rd or 4th grade. A concise overview of all of Michigan's history up to the present. Michigan's Story also discusses contemporary issues such as, selling water from the Great Lakes. It helps connect with 8th grade GLCEs. Michigan's Story is complete with maps, photos, and graphics. Chronological presentation from the ice age to today. 7th grade reading level. 15 chapters 250 pages. Student questions are included with each lesson. Teacher's Guide. Has answers to student questions and hints to accompany the class activities and discussion questions. 75 pages. Ready to Use Tests. Chapter tests and final exam with short answer, multiple choice & true and false questions. Answers & page reference included. In printed version or in Microsoft Word files for Mac or Windows on CD. 77 pages. 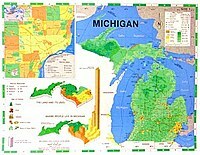 Chapter 5 * MICHIGAN JOINS THE U.S.
Chapter 7 * ALMOST A STATE - GROWING LIKE A WEED! 15 lessons in this set enhance the concepts in Michigan's Story. 75 pages in 3 ring binder. Lessons use a beautiful 18 by 23 inch, two sided, very detailed, full color laminated map. A great addition to any Michigan unit! Students can see the places they are studying. Land elevation, population density, land use, international and state boundaries, locations of rivers and lakes, and much more are shown. Skills can be introduced, applied and practiced. A set of lessons is free with each 25 maps ordered. SIDE 1 shows Michigan and the Great Lakes along with an inset map of the Detroit Metro area. SIDE 2 shows the entire Great Lakes Region from Wisconsin to the mouth of the St. Lawrence River! We will be happy to tell you all about our products. Copyright © 2017 Hillsdale Educational Publishers, Inc. All rights reserved.